Silent auctions can be a great fundraising opportunity for any charity. Pay close attention to the details surrounding the auction to obtain the most benefit. Contact the local chamber of commerce to obtain a calendar of events. Many craft fairs, home shows, and other community events offer free space to non-profit and charitable organizations. Contact each one for space availability and event rules. Choose which events to attend carefully. Longer events tend to have higher attendance. Home shows tend to have less charity booths than health fairs, which translates to less competition for donation dollars. The best space for a silent auction is one in which the tables can be accessed on all sides. If that is not possible, a corner space is the next best option as it allows for 2 sides to display donations. If there is an option of choosing the location, pick a high traffic area. This can be by the entrance, near the rest rooms, or near food vendors. Approach local area businesses for donations. Explain what event the silent auction will be at and how their gift will assist your organization. Offer free advertising in return. Request business cards to be placed next to their donation. Explain their company will be posted on a “thanks to our sponsors” board. If the event you are planning to hold the auction at offers printed programs, explain to potential donors the ad in the program will also list their company name. Be sure to follow through with this, compiling the sponsor list and submitting it to event coordinators by the required deadline. Drape table coverings so they just reach the floor on the customer side. Allow plenty of space, at least 12 inches, between each donation if at all possible. Place the auction sheet directly in front of the item, with the sponsor’s business card stapled on the top. Place a pen or pencil on each side of the sheet, with a small stack of business cards above it. Enlarge each business card on a photocopy machine or scanner to paste on a poster board entitled “thanks to our sponsors”. Create a second poster board that tells about the charity and what it plans to do with the funds raised. Hang both posters on a wall or set them on an easel behind the tables. Each poster must be highly visible and easy to read. 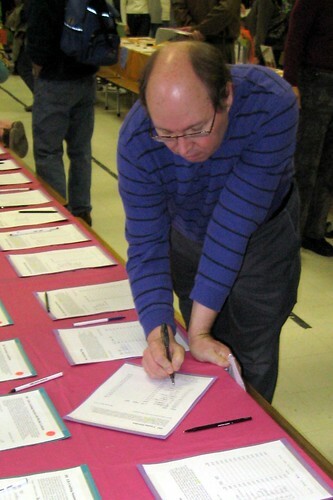 Excellent results are easily achievable with a silent auction. Take the time to research the possible venues and negotiate with corporate sponsors. Pay close attention to details throughout the process to achieve maximum results. As a writer for Crowdcomms, the author of this piece gets to write about some of the technology they provide to further enhance events such as charity fundraising auctions. They even provide mobile phone apps specifically designed for use at silent auctions.